Thank you for your interest in a Group Visit to the Michener Art Museum! Minimum group size is 10 for discounted admission. Please call for current admission rates. Please note that fees may change with certain special exhibitions. Guided tours are one hour long. Please indicate any special focus for the tour. 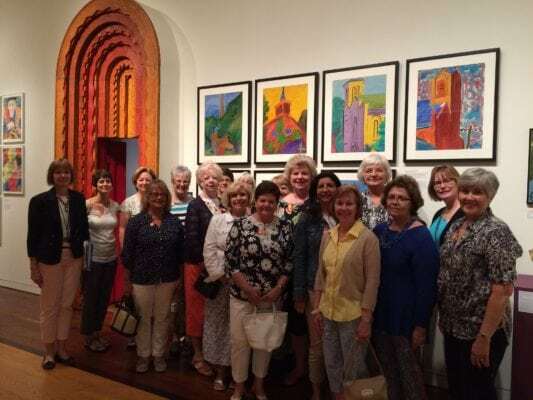 We offer a tour with highlights of all galleries, can focus on special exhibitions or the permanent collection or customize for a topic of interest. You are welcome to linger in the galleries after the tour. Docent fee: $2 per person, minimum 10 per docent group. Several docent groups may rotate through the galleries at one time. Maximum guided group size per hour is 60. The cafe at the Michener offers an a la carte menu. Seating for 15 indoors plus expansive outdoor sculpture garden seating. Are you planning to eat in the cafe? Tour lunch package includes admission, docent fee, private room rental & lunch. Inquire for current rates. Would you like to reserve a private dining room?